Desert Blonde Tarantulas are often purchased by first-time tarantula owners, as they are generally docile and easy to care for. They're also quite beautiful with their long, beautiful blonde hair and long legs. Tarantulas have two body parts, the cephalothorax and the abdomen, as well as eight legs, and two pedipalps (claws). They use their pedipalps to catch and transport their prey and transfer food to their mouth and fangs, which are on their underside. In the wild, these tarantulas dig long, deep burrows; they produce a silk-like thread which they put over the entrance. The silk not only entraps prey, but it also helps to reinforce the burrow. Because they hail from the American desert (Arizona, California, and Mexico), desert blond tarantulas are less expensive and more easily obtainable than many other more exotic tarantulas. Desert blonde tarantulas are generally quite docile animals that usually remain in the open and are fun to watch as they burrow or climb. Individual pets, however, may be more or less aggressive. A more aggressive tarantula may be more likely to release its urticating hairs—sharp hairs on the abdomen which can cause irritation. Desert blonde tarantulas are venomous, but their venom is very mild. In most cases, a bite from a desert blonde will cause itching or stinging unless the pet owner happens to be allergic. Desert blonde tarantulas hunt at night and are thus most active after the sun goes down. As with all tarantulas, desert blondes are "look only" pets that should not be handled often. They make fascinating pets for hobbyists and older children but are not appropriate for children younger than age 10. Most desert blonde tarantula pets are caught in the wild and not bred in captivity. In part, that's because the males breed only once in a lifetime. If you do wish to breed this species, you will need to place a mature male in a tank with a mature female. Once they breed, you'll have to separate the two immediately or the female will eat the male. If the female does produce an egg sack you'll need to remove it and allow the eggs to hatch in a separate tank. A small (5 to 10 gallon) tank is suitable for desert blonde tarantulas. The width of the tank should be two to three times wider than the leg span of the spider wide. Avoid a very tall tank and wire mesh tops as the desert blondes do climb and can be injured as a result of falling or catching a leg in the wire. Three or more inches of peat moss, soil, or vermiculite can be used as a substrate. Wood, cork bark, or half of a small clay flower pot can be used for a shelter/retreat. Desert blondes will often dig a deep burrow in the substrate. Desert blonde tarantulas prefer a temperature of about 75 to 80 degrees Fahrenheit (24 to 27 Celsius) and humidity between 65 and 70 percent (though, as they come from a dry climate, they are tolerant of dry weather). If the temperature does drop significantly, your pet will need some additional heating; appropriate heating strips and pads are available at most pet stores. Lighting is not an issue for this species. Tarantulas are hunters, and they must be fed live prey. Crickets and other large insects (must be pesticide-free), and the occasional pinky mouse for adults are good options. Do be sure, however, that the prey is smaller than your pet. While these tarantulas can eat quite a few crickets, they are also able to go for long periods without eating. It's a good idea to provide a flat ceramic dish of clean water; avoid deeper dishes as they create a drowning hazard. There are no vets that treat tarantulas, so health care is up to the pet owner. Fortunately, desert blonde tarantulas are usually very hard and long-lived. Do keep a careful eye out, however, for behavioral changes such as lethargy, loss of appetite, or unusually restlessness. 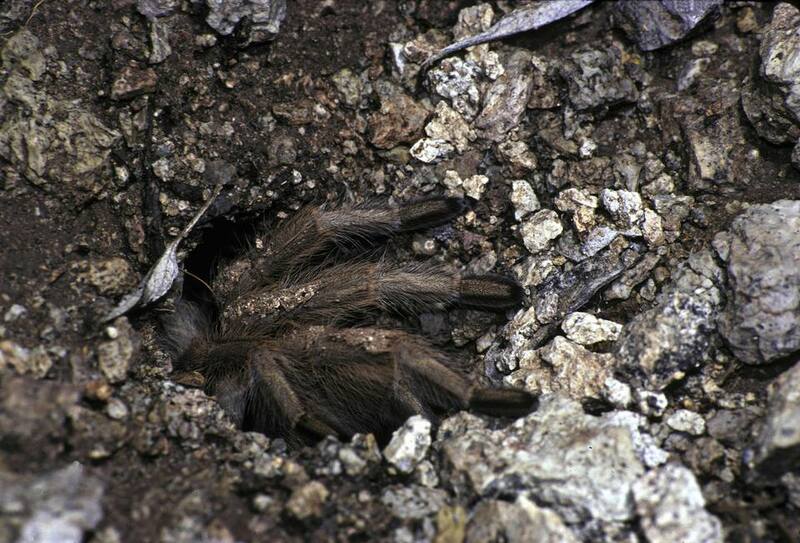 If kept in a damp substrate, however, these tarantulas can develop fungus. Similarly, parasites and dehydration can cause problems. You can easily resolve these problems, however, by cleaning your pet's tank and being sure that you're providing appropriate food and water. Tarantulas do molt, and the process can be disconcerting for a new owner. Spiders do seem "off" just before they shed their skin as well as the lining of their mouths and many of their organs. It takes several weeks for a molting tarantula to get back to normal. While it is possible to purchase a desert blonde tarantula at a pet shop, you may need to do some searching. A much easier alternative is to purchase your pet tarantula through an online source. Be sure, however, to carefully research your source; you want to be certain that they have a good reputation for providing healthy pets and, ideally, offer support and information after your purchase. Otherwise, check out other tarantulas that can be your new pet.